In his last blog posting, Jay described how we often sail from our home port of the Montague Marina to Souris. 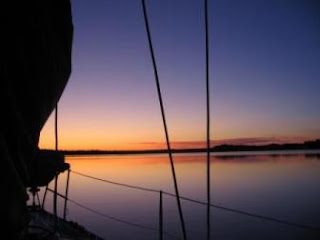 It is a 45 minute sail up the Montague River to Georgetown, then across Cardigan Bay, around Boughton Island and north to Souris, a trip of about 5-6 hours in all. But a closer cruising ground which we enjoy sailing if we have less time is the Three Rivers area. The Montague River, Brudenell River and Cardigan River empty into Cardigan Bay, all near Georgetown - hence the name The Three Rivers. There are nice anchorages off Boughton Island for day stops, though watch the tides and currents if you are swimming south of Boughton Island as they can be strong. Panmure Island and St. Mary's Bay also offer nice anchorages during the day. Another popular swimming spot is off the east side of Panmure Island and boats often anchor there on warm sunny days. St. Mary's Bay can be more challenging for a sailboat, as depths can be shallow and the Bay has many mussel buoys. Like in Montague, there is a marina with some services at the head of the Cardigan River in the village of Cardigan. Cardigan also offers a liquor store, some shops, gas stations and convenience store. You can anchor just south east of Georgetown Wharf, or tie up to the wharf for a trip into town. Georgetown offers restaurants, shops and a theatre. Watch the tides near the wharf as at low tide you can go aground if you are not careful where you tie up. My personal favourite though is to sail up the Brudenell River. Although there lost of mussel beds, if you stay in the channel there is lots of water. Pass Brudenell Island, and then the river widens to offer a great overnight protected anchorage, or you can tie up to the docks. If you draw over 5 and half feet, stick to the outer docks on the end; any closer to shore you may ground at low tide. These docks are maintained by the Brudenell River Provincial Park. Ice is available at the campground office. There are some shower facilities in the day use section of the park, which can be used by marina guests. The maina is also located beside the Brudenell Rodd River Resort and three golf courses, including the famous Dundrave and Brudenell River courses. We have golfed both courses and they are beautiful. You can also explore the pioneer cemetary on Brudenell Island. There is good swimming here too!